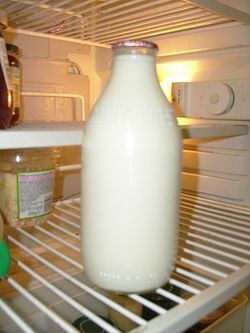 The milk also has a role in immunity. Substances present in human milk are able to kill intestinal protozoa such as Giardia lambia and, in addition, has the function of protecting infants against this and other infections. Breast milk contains immunological substances that confer passive immunity for the child, such as IgA, lactoferrin, lysozyme, macrophages and other antibodies. The cow milk in its natural state contains approximately 87% water, 3.5% of fat, 3.6% protein, 4.9% carbohydrates (lactose) and minerals like calcium and phosphorus. The amount of water is reduced to approximately 4% when in the form of milk powder. Milk is also a source of vitamins C (human milk 3.8 mg/100ml and cow milk 1.5 mg/100ml) and D (human milk 0.8 μg/100ml and cow milk 0.15 μg/100ml). Lactose is a disaccharide found naturally only in milk and its derivatives and it is composed of galactose linked by a β 1-4 glycosidic bond to glucose. ↑ Belitz, H. D; Grosch, W,; Schieberle, P John M (2009). Food Chemistry (4th ed.). Berlin Heidelberg: Springer. p. 498. ISBN 978-3-540-69933-0. ↑ Newton, David E (2007). Food Chemistry. New York: Facts On File, Inc., Infobase Publishing. p. 57. ISBN 978-0-8160-5277-6. ↑ Hickman Jr., Cleveland P.; Roberts, Larry S.; Keen, Susan L.; Larson, Allan; l'Anson, Helen; Eisenhour, David J (2008). Integrated Principles of Zoology (14th ed.). Boston: McGraw-Hill. p. 772. ISBN 978-0-07-297004-3. ↑ Yeung, David L.; Laquatra, Idamarie, ed. (2003). Heinz Handbook of Nutrition (9th ed.). H. J. Heinz Company. p. 209. Library of Congress Catalog Card Number 95-076641. ↑ 5.0 5.1 deMan, John M (1999). Principles of Food Chemistry (3rd ed.). Gaithersburg, Maryland: Aspen Publishers, Inc.. p. 1;35;112; 164; 214. ISBN 0-8342-1234-X. ↑ Truswell, A Stewart (2003). ABC of Nutrition (4th ed.). London: BMJ Books. p. 24. ISBN 0-7279-1664-5. ↑ Gropper, Sareen, S.; Smith, Jack L.; Groff, James L (2009). Advanced Nutrition and Human Metabolism (5th ed.). Belmont, CA: Wadsworth. p. 67. ISBN 978-0-495-11657-8. This page was last modified on 30 August 2013, at 17:48.